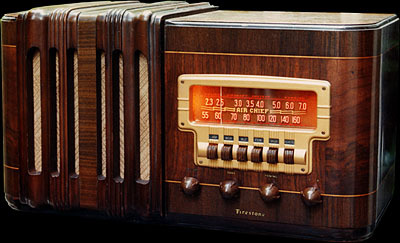 This radio was made for Firestone by Stewart-Warner. It's approximately 19-1/2 inches (495 mm) wide. This style of wood cabinet table radio was called a "laydown," meaning they took the earlier tombstone style cabinet, and instead of putting the speaker up above the chassis, they laid it over and put the speaker on the side of the chassis. 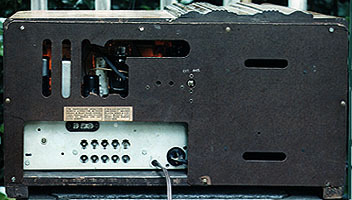 Tube complement: 6SA7 mixer, 6J5GT oscillator, 6SK7 IF, 6SQ7 detector, 6F6G audio output, 5W4G rectifier. This radio's circuit is almost as simple as the 5-tube All American Five design. The 6SA7 could be used successfully as both a mixer and local oscillator, but here these functions are broken out to two separate tubes. A cheap way to increase the tube count for sales purposes. In fairness, this radio is a solid transformer-powered AC-only design, and uses a robust 6F6G audio output stage. It sounds much better than the typical All American Five set. This radio has an extraordinarily pretty dial. 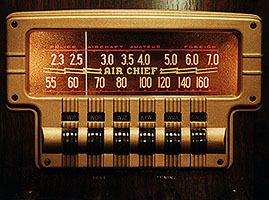 By 1940, radios were getting backs, instead of being open behind. I don't know if backs first appeared for safety reasons, to keep straying hands from contacting metal parts or hot tubes inside, or as a support for the loop antennas which were becoming common at around this time. 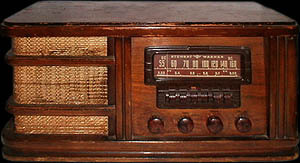 Here's a similar radio that Stewart-Warner chose to market under its own brand name. It's the Stewart-Warner model 61T16. I think Firestone got the better deal, cabinet-style-wise; don't you?